Saratoga was still stirring from Michael Vincent Magnier’s $2 million winning bid on a Storm Cat colt at the yearling sales when Amtrak’s Adirondack arrived on Wednesday morning an hour and a half late from New York. Trains departing Penn Station are usually on time. The trains coming down from Rutland, Vermont or Montreal, Quebec heading south are the problems. In any case, it was good to see so many people beating the high price of gas in this manner. Taking Amtrak is as hit-and-miss as buying a racehorse. But the journey is scenic and, for the most part, reliable. Sit on the left coming north, and the right going home. And bring your coffee aboard. They don’t serve it. By the way, are you wondering how I learned about the Adirondack’s tardy arrival? Well, I was on it. Tuesday being the dark day, I visited my first grandchild in Queens. At age five days, nine pounds and 20 inches long, Charlie Zast may not have the size yet to ride a Thoroughbred, but he’d do just fine as one of those bobblehead dolls that the track gave away on slow Sundays. NYRA has only 23 more racing days to fix the broken lights on the tote board and to move the information booth in front of the clubhouse entrance out of Lake Ontario. But, suffice it to say, these blemishes are just a diaper rash on an otherwise splendid operation, top to bottom. Only one guy has cause to complain. And his name is Bill Mott. 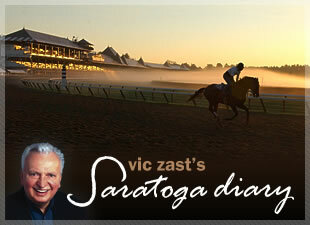 The wise guys spread the word that Zensational, trained by Mott, was a cinch in the seventh. But Kent Desormeaux took the inexperienced colt out of gate and into the turn with abandon, and the first-time-out son of Unbridled’s Song struck a sour note. Mott, who was last year’s leading trainer, has only one win in over 20 starts this year. Kensei, trained by Steve Asmussen, prevailed in the seventh and paid $17.00. But what made his effort worth writing about was the way Last Martini, another runner in the race, took his jockey and an outrider down in the post parade. Horses dump their riders occasionally. But few are able to strike twice while they’re at it. It was Sackatoga’s Doc N’ Roll that crossed the line first for Barclay Tagg in the $150,000 New York Stallion Series Cab Calloway Stakes. Credit the cool Eibar Coa for a clever ride, but note also that Sam the Bugler and baritone Tom Durkin might have given the Wheelaway 3-year-old some dulcet inspiration. As the field of New York-breds entered the track, the bugler played “Minnie the Moocher,” and Durkin, the track announcer, led the crowd in a chorus of “Hidee, hidee, hidee, ho!” Durkin couldn’t have been more apropos had he sang out “All aboard” for a train departure.